In recent years, the military has sanitized their marching cadences. Now the “yellow bird” gets his “little head” smashed, rather than his “f’ing head.” Surely, this has caused great relief among ornithologists everywhere. Unfortunately, they have not been able to prettify the nature of warfare itself. Incidents from the Iraq War will haunt survivors in Alexandre Moors’ Yellow Birds (trailer here), which opens this Friday in New York. Brandon Bartle is twenty-one, making him a veritable gray beard compared to eighteen-year-old Daniel Murphy, but they are both from rural Virginia, so they bond during basic training. Sergeant Sterling also recognizes their reliability, so he takes them under his wing, at least to an extent. This is mostly a good thing, especially when they first arrive in-country. We can tell from the flashback structure something profoundly unfortunate happened during their deployment, but Bartle clearly survived, since we watch the film through his remorseful POV. It is not long before we realize Murph’s fate remains unresolved, because a good deal of the third act involves his mother Maureen Murphy’s crusade for the truth. She is the one played by executive producer Jennifer Aniston (that’s right, Rachel from Friends is playing the mother of an eighteen-year-old). 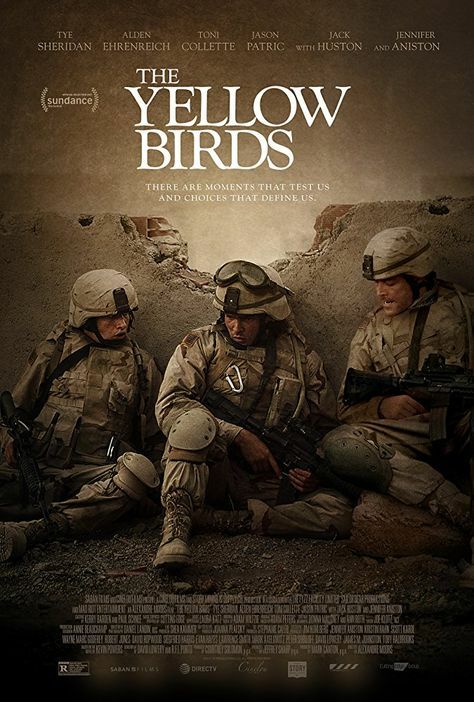 Reportedly, Yellow Birds was recut after its Sundance premiere, which makes sense considering there are cast-members listed on its imdb page we’re at a loss to remember. The current cut is pretty tight and the temporal shifts mostly work, which is saying something. However, the current cut is probably not sufficiently scathing to satisfy to the anti-war left (which includes our current president), nor is it sympathetic enough to appeal to military families and supporters. Instead, it feels like it walks a carefully calibrated line down the middle, like one would more expect from a TV movie. Alden Ehrenreich (who has had a tough summer with Solo) is very good as Bartle. He does his share of brooding, but it is a more complex performance than just that. Toni Collette also elevates the largely stereotypical role of his mother Amy (between this and Hereditary, she gives quite a composite portrait of motherhood). Aniston is fine as Mother Murphy, but it is a very safe role. However, Jack Huston is terrific as the increasingly unstable, but still formidable Sgt. Sterling. Most disappointingly, Jason Patric is largely squandered as CID Captain Anderson. David Lowery’s screenplay, subsequently worked over by R.F.I. Porto, represents a good faith effort to adapt Kevin Powers’ novel. The film exhibits genuine empathy for Bartle and Murphy, which is to its credit. There are also some relatively convincing scenes of warfighting, but it never reaches the level of classical tragedy that it clearly aspires to. Indeed, it feels rather narrow in scope, especially compared to Patric’s classic war movie, The Beast. Yellow Birds is not a scandal, but it still doesn’t justify Manhattan ticket prices when it opens tomorrow (6/15), at the Village East.